It’s autumn! What happened?! I had a lovely summer, not writing a book! That feels really strange and alarming to write, but it has been SO nice having proper time off this summer. Last year I was struggling to start Jelly, and the year before I was doing a complete rewrite of Electrigirl and the Invisible Thieves in a terrible rush because A Storm of Strawberries was waiting to be written, and I was also attending three festivals as well as trying to spend time with my children. So this year I promised myself some proper time off, and it was GREAT. I went to Lyme Regis in Dorset with my family and swam in the sea, looked for fossils and watched an old childhood favourite film: One of our Dinosaurs Is Missing. I also ate some delicious salads, took quite a few daytime naps, and went to see The Incredibles 2 and Ant-Man and the Wasp at the cinema, both of which I thoroughly enjoyed! Today is the first day of term and so my girls are out of the house and I’m at my desk for the first time in weeks. Am I starting a new book, you ask? Well, no – not yet! 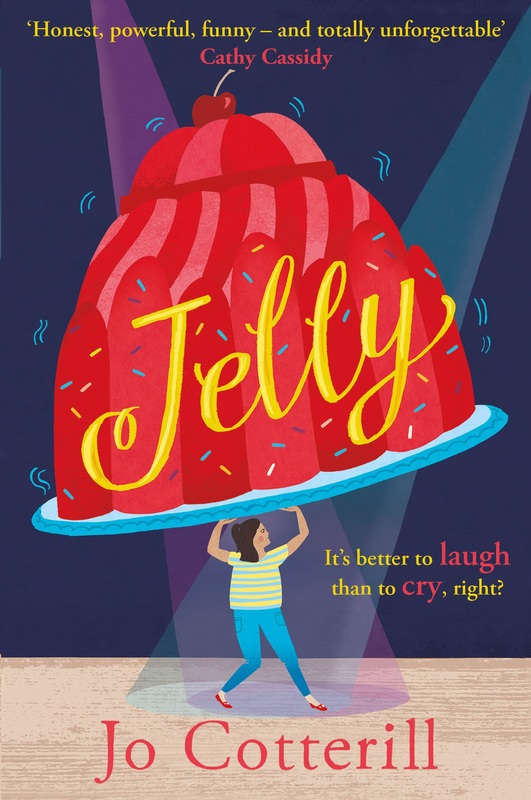 Instead, I’m working on a brand new website based on my new book JELLY. So much goes into a book, from design, edits, research etc etc – and most of this stuff is never seen. So I’m gathering together a load of things that will show how this book was developed, from first idea to final published copy. Not only that, but there will be a complete scheme of work for any teachers interested in using the book in schools – along with exercise sheets, information videos, and masses of PSHE and cross-curricular ideas. As of today, Jelly has 34 unanimous five-star reviews on Amazon.co.uk, which is the most of any of my books. I am so, so grateful to anyone who takes the time to review. I honestly appreciate every single one of them, because not only does it give me a lovely warm feeling to know someone has enjoyed my book, but it also means that my chances of being published in the future are greater because publishers can see the support I have. This book means a lot to me personally, so that’s why I’ve chosen it as the basis of a new website which will be stuffed full of useful and interesting things. I hope to get the website up and running by the end of this month, and after that…well, I have another randomly different idea. A new project! But not a book (yet). Watch this space…! Best of luck with the website! 🙂 And those pebble pictures are beautiful!